Flow Table for Cement Testing - This is used for determining the workability of building limes. The flow table consists of a 30 cm dia polish steel plate with 3 engraved annular circles 7, 11 and 19cm dia. The table top is arranged for a free fall of 12.5mm by a cam action. Supplied complete with one brass conical mould, 65mm i.d. at base and 40mm i.d. at top, height of the mould 90mm..
We are leading manufacturers, suppliers & exporters of Flow Table For Testing Lab for Cement Testing Lab. 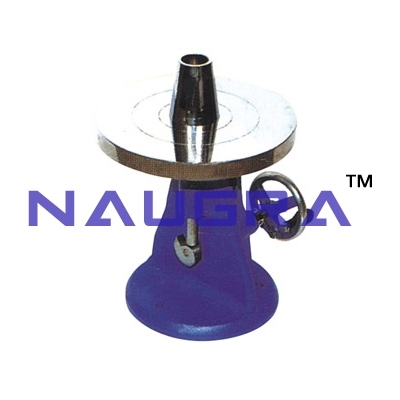 Contact us to get high quality designed Flow Table For Testing Lab for Cement Testing Lab for schools, colleges, universities, research labs, laboratories and various industries. We accept bulk orders for government tenders in all countries around the globe.